Embedding tissue into paraffin blocks supports the tissue structure and enables very thin sections to be cut and mounted onto microscope slides for analysis. This protocol describes how to cut sections from tissue embedded in paraffin blocks (2:48 minutes). ​For other video protocols please visit our video protocol library here. Chill paraffin-embedded tissue blocks on ice before sectioning. Cold wax allows thinner sections to be obtained by providing support for harder elements within the tissue specimen. The small amount of moisture that penetrates the block from the melting ice will also make the tissue easier to cut. Fill a waterbath with ultrapure water and heat to 40-45oC. Place the blade in the holder, ensure it is secure and set the clearance angle. The clearance angle prevents contact between the knife facet and the face of the block. Follow the microtome manufacturer’s instructions for guidance on setting the clearance angle. For Leica blades this is normally between 1o and 5o (Figure 1). Insert the paraffin block and orientate so the blade will cut straight across the block. Carefully, approach the block with the blade and cut a few thin sections to ensure the positioning is correct. Adjust if necessary. Trim the block to expose the tissue surface to a level where a representative section can be cut. Trimming is normally done at a thickness of 10-30 µm. Cut sections at a thickness of about 4-5 µm (you will probably need to discard the first few sections as they are likely to contain holes caused by trimming). Using tweezers, pick up the ribbons of sections and float them on the surface of the water in the water bath so they flatten out. Use the tweezers to separate the sections. Use microscope slides to pick the sections out of the water bath and store upright in a slide rack. Place the slide rack into an oven and allow sections to dry overnight at 37oC. Figure 1. Blade clearance angle. The clearance angle of the blade prevents contact between the knife facet and the face of the paraffin block. The blade clearance angle should be adjusted to achieve optimum performance. 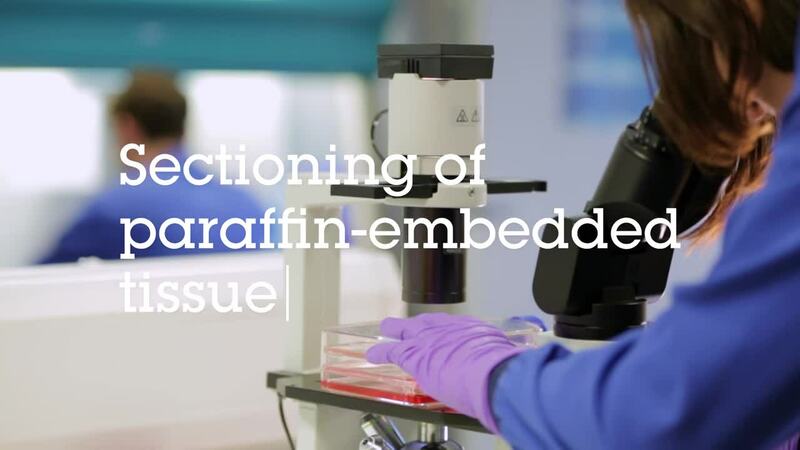 Now read our IHC for paraffin embedded sections protocol.